Is it ever OK to swear in the workplace? Ask around and you’d probably get varying answers. What may be considered taboo is in reality pretty common and if we’re being honest, you find swearing in almost every workplace. You also find swearing at all levels of the organization, leadership and even (especially) executives don’t seem to be exempt. As a consultant, I’ve worked in a lot of organizations in various industries – from Manufacturing to Financial Services to Not for Profit. I would agree that swearing is prevalent in many of today’s organizations and although not ideal, expecting it to stop completely might be a bit (or a lot) naïve. Today there is research out there that even supports the use of profanity in the workplace, stating there are some benefits to it. Studies have shown that swearing helps to relieve stress. It can make a speaker seem more credible and even more human to their audience. According to research conducted in the UK, swearing in a non-abusive manner can even help to build relationships and foster a team environment. Although this research tends to lean towards the positive and might seem all well and good there are other factors to consider (including legislation). 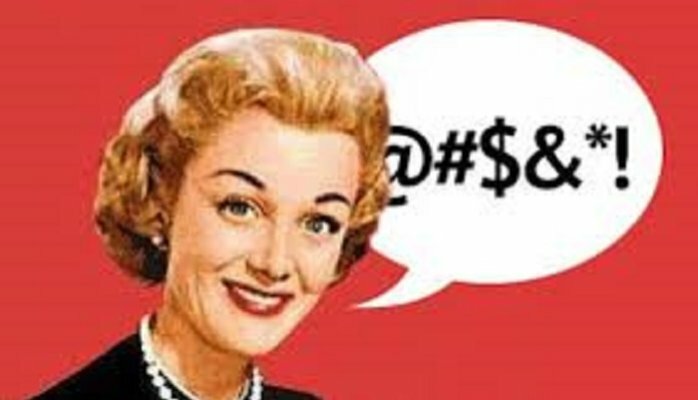 An article from the Globe and Mail talks about how it can be difficult to pin down profanity as it can be humorous on one side of the spectrum, or hurtful on the other. Sometimes the interpretation is simply based on the audience. Even when using profanity in a joking or non-offensive manner, it can still be a concern in the workplace if someone is offended by it. When thinking through how to address profanity in the workplace, employers need to consider a couple of things. The first is the culture of the organization. In certain organizations it makes sense to ban profanity completely, for example in an organization that provides counselling services and where profanity may bring up certain emotions for the clientele. In other organizations, some leniency may be ok or even welcome. Ask yourself what kind of culture do you have currently? If a co-worker overhears profanity being used in your workplace, will they be offended / upset by this? And perhaps the most important question to ask yourself is not the state of your current culture, but what type of workplace environment do you want to foster? In addition to assessing your current workplace and its culture, employers also need to consider the legislation in place. Profanity could be perceived to negatively impact an employer’s obligation to provide a safe workplace based upon the requirements of Health and Safety Legislation. In fact, the legislation is tightening up on this. Ontario has implemented legislation under violence and harassment that includes a new addition to the definition for verbal abuse – “Vexatious Comment”. This means that inappropriate comments, such as the use of profanity, can be considered an act of violence according to legislation in Ontario. It’s safe to assume that these regulations will be considered for adoption in other provinces as well. So, if it’s not realistic to completely remove profanity from your workplace (or if you choose not to remove it), clear lines must still be drawn and expectations communicated. While some organizations may choose to tolerate general swearing (i.e. swearing at the copier, using profanity as an adjective when sharing a story, etc), when we turn that language towards others it becomes inappropriate no matter what the context. This is typically called “Directed Swearing”. I stress this term when going through respectful workplace training with clients. Directed Swearing crosses the line in all organizations. Using profanity directed at a co-worker, client, supervisor or visitor in a derogatory manner is disrespectful and violates any well written Respectful Workplace Policy (in addition to legislation). This is especially true when the directed swearing happens in the context of frustration or anger. Directed swearing will often (and correctly) be understood as harassment. Maybe it is time to evaluate how much swearing happens in your workplace. However, the thought of “zero-tolerance” for swearing should also be scrutinized. Zero tolerance can create disbelief in policies that likely won’t be perceived as meaningful, realistic or even part of the “real world”. If a policy is thought to be naïve, it won’t be taken seriously enough to be followed and will bring no change on the more concerning issues (like Directed Swearing) that you’re really hoping your well written policy and training will actually address and prevent. This may be a pragmatist approach, but sometimes being realistic about human behaviour will help you prevent the serious issues that we all agree are offensive.